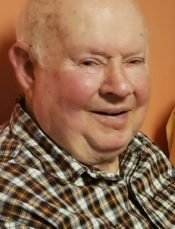 Mr. Cleveland D. Godwin, age 86 of Pensacola, Florida went to heaven to be with the Lord on April 8, 2019. A service celebrating his wonderful life will be at 11AM on Wednesday, April 17, 2019 at Pine Haven Baptist Church. Visitation will be on Tuesday, April 16, 2019 at Pine Haven Baptist Church from 5-7PM. Burial with military honors will follow the service at Barrancas National Cemetery in Pensacola, Florida. Mr. Godwin was born in Brewton, Alabama on January 5, 1933 to Lewis and Lillie Godwin. He served his country in the United States Army fighting in the Korean War. He retired from St. Regis Paper Company and was an active member of the ESCO Sherriff’s Posey for over 30 years. He was an active member of Pine Haven Baptist Church. Mr. Godwin is survived by his wife of 49 years Pauline Nichols Godwin; son John Edlund III and his wife Pamela; Grandson John Edlund IV. Brother Dewey Godwin and wife Brenda; Helon Hawke and Dorthy Carter. The family of Mr. Godwin would like to thank all the family and friends who have been by there side and has prayed for them during this most difficult time. Covenant Hospice has been a God send and we as a family can never thank them enough. In lieu of flowers, please make donations to this blessed organization. Sorry to hear of his passing. My prayers and condolences go out to his family. Prayers for comfort & strength. It isn’t good bye. It’s see you later! I have such good memories of Uncle Cleve – so many of Carolyn’s family now gone….my heart is saddened for another loss for you all! Love to your families and we will see you next week!